Kings of Leon fans will love this unique jersey-style T-shirt, loaded with subtle references to the band without specifically naming it. The cherry logo on the front is taken from the artwork of the band's first EP, Holy Roller Novocaine. The back features the brother's and band member's last name across the nameplate. And of course a Kings of Leon shirt in a football jersey style would feature a Roman numeral 7. 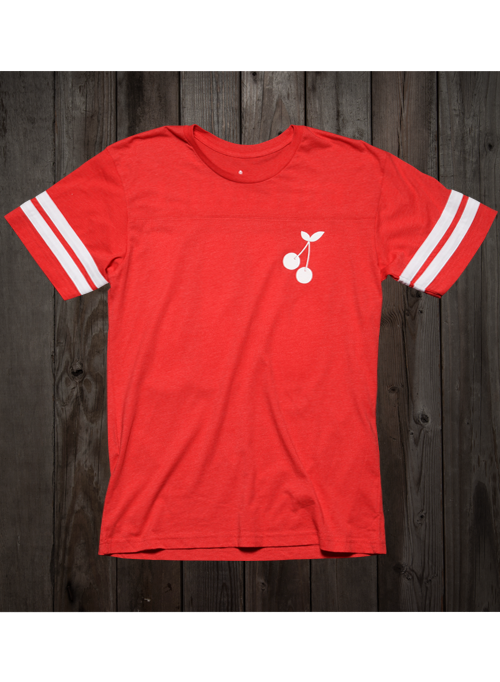 All of that is printed on an LAT 6937 shirt in red featuring a 60/40 combination of ringspun cotton and polyester for a soft, sturdy feel. True fans will love this shirt that is as much a collectible as it is a statement of fan pride.